Her work is well known with over 150 scientific publications that have received more than 12000 citations and a ten best paper award nominations and awards. She is co-inventor of 40 filed patents and she is a regular keynote speaker at international conferences. Nuria’s work and professional trajectory has received several awards, including the MIT TR100 (today TR35) Young Innovator Award (2004), the Rising Talent award by the Women’s Forum for the Economy and Society (2009), the European Digital Woman of the Year award (2016) and the Spanish National Computer Science Angela Robles Award (2016). She has been named “an outstanding female director in technology” (El PAIS, 2012), one of “100 leaders for the future” (Capital, 2009) and one of the “40 youngsters who will mark the next millennium” (El PAIS, 1999). 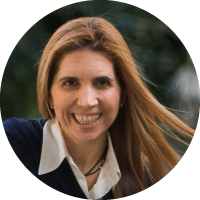 She became a Fellow of the European Association of Artificial Intelligence in 2016 and an IEEE Fellow and an ACM Fellow in 2017, being the only Spanish female scientist to have been named a fellow by these three prestigious world-wide organizations at the same time. Her passion is to improve people’s quality of life, both individually and collectively, through technology. She is also passionate about scientific outreach. Hence, she regularly collaborates with the media (press, radio, TV) and gives non-technical talks about science and technology to broad audiences, as well as audiences primarily made up of teenage girls. HOW DID YOU GET TO BECOME AN EXPERT IN BIG DATA? I studied Electrical Engineering in Spain, followed by a PhD in artificial intelligence from MIT. My interest has always been to invent technology that would be capable of understanding us as a necessary step to build technology that can truly help us. Hence, I have specialized in machine learning data-driven models of human behaviour. What has changed over time is which data and which behaviors I have modelled. I started my career modelling individual behaviors from video. I built a system called LAFTER back in 1996 which was one of the first real-time facial expression recognitions systems. I then became interested in modeling human interactions, which presented a new level of complexity. I proposed a probabilistic framework to automatically recognize human interactive behaviors. I also worked in a car and built a system that was able to predict the most likely maneuver by analysing data from a variety of car sensors and cameras and in a smart office that would recognize automatically what you were doing from multiple sensors. By 2004, I realized that the most personal computer was going to be the mobile phone and decided to focus on modelling human behaviour from mobile data and that led me to Big Data, given the vast adoption of mobile phones. Since then, I have worked on projects to infer a variety of individual and aggregate traits (e.g. personality) and behaviors from mobile data. WHAT AREAS OF BIG DATA ARE YOU MOST PASSIONATE ABOUT? Within Big Data, I am very passionate about leveraging the availability of large scale human behavioural data to help us make better decisions and to drive positive social change. It’s a research area that I call Big Data for Social Good. I am also passionate about exploring new opportunities that are only possible thanks to the existence of large scale data, always placing people and people’s needs at the centre. I am also very interested in developing F.A.T.E. algorithms and technology, that is, technology that is fair (i.e. which minimizes potential biases that might result from e.g. training with biased data); accountable (i.e. with clear understanding of who is responsible of the consequences of using a certain technology); transparent (i.e. explainable) and ethical (i.e. in accordance and respecting an ethical framework that respects and fosters human values). WHICH BIG DATA INFLUENCERS INFLUENCE YOU? I have had the privilege of learning from and working with extraordinary people that I admire, including my PhD advisor, Prof Sandy Pentland, Dr. Eric Horvitz, Dr. Jennifer Chayes and Dr. Mary Czerwinsky. I also enjoy and follow the work of some of the Big Data influencers in your list, including Dr Kate Crawford and Dr Fei Fei Li. OUTSIDE OF BIG DATA WHO ELSE INFLUENCES YOU ? I follow the scientific literature and key research progress in the areas of artificial intelligence, intelligent user interfaces, ubiquitous computing, mobile computing and computational social sciences. As I mentioned in one of my research interests, I think we are going to see increased efforts in the topic of F.A.T.E. technology, which is from my perspective very much needed. Artificial intelligence-powered technology is so ubiquitous in our lives that it influences many of our decisions and behaviors, many times in ways that we don’t even know. We need ensure that the technology that we use is on our side, that there is an alignment between its optimization function and our wellbeing, that is transparent, accountable, fair and that respects our ethical values. My main passion is to carry out human-centric research in artificial intelligence, powered by Big Data. At the same time, I am passionate about scientific outreach and hence I give talks on a variety of topics (artificial intelligence, the future of the mobile phone, the future of work, the future of education, women in tech, …) to broad audiences and especially to teenagers to inspire them –and particularly girls—to pursue careers in technology. I am also in the external advisory board of several institutes, research labs and for the Spanish Government.